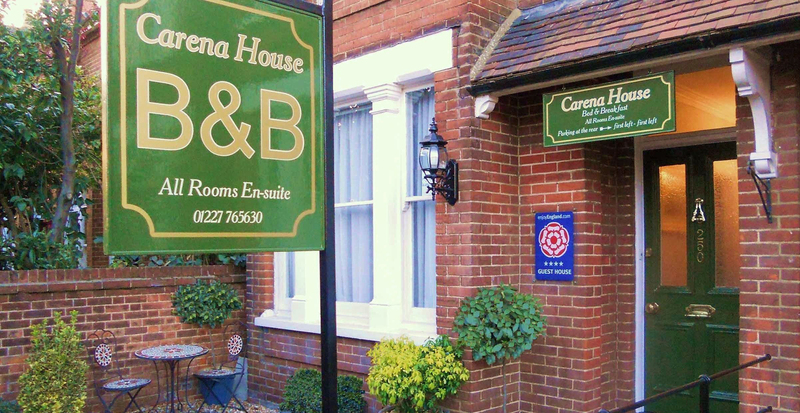 Carena House is a “4 Star” Victorian bed and breakfast in Canterbury Kent. We are a member of “Visit Britain” (Enjoy England and Quality in Tourism) and as such are inspected annually to ensure that we give you the 4 Star b&b quality that we have been awarded for. Our prices for a 4 Star bed & breakfast are very competitive for the Canterbury area and are comparable to any other 3 star b&b. We have 5 guest rooms, all with en-suite shower, basin and toilet facilities. Our rooms comprise of, 1 Single, 1 Twin (2 single bed), 2 Doubles and a Family room (Double bed and a single bed). All rooms apart from the family room are at the rear of the house, so no traffic noise. We also offer FREE WIFI for your internet access. We pride ourselves on our cleanliness and the attention to detail that is expected of a quality b&b. Many of our customers return time after time because once you find a place like Carena House b&b, why go anywhere else? Carena Guest House is not just a business to me, it’s also my home, and as a guest in my home you would be welcomed and made comfortable. There is ample free on road parking behind the b&b and secure parking for motorbikes within our large secure gates. If you don’t want to take your car into the city we are only a 10 minute level walk into the heart. When you reach the centre you can visit the world famous Canterbury Cathedral. A stay in someone’s own home is so much nicer, and comes with great personal service and a wonderful breakfast to start your day (Check out our breakfast on the “Dining room” page). It’s something were very proud of. Whether it’s for a holiday, business trip or just to get away for a couple of days, you’ll be happy you found Carena House, bed and breakfast in Canterbury. For your health and safety, we have a fully automated radio fire alarm system fitted throughout the house with break glass call points on the landings. There is also fire extinguishers and emergency lighting throughout. 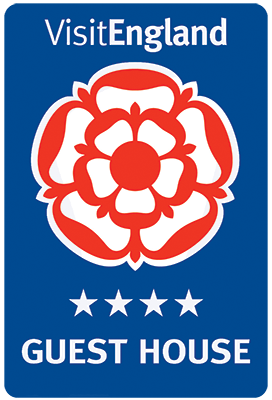 We have just been awarded for 2015/2016, 5 Stars from Kent County Council for food hygiene. Peaceful, relaxing, comfortable, clean, friendly and Safe Come see us. To book a room please click the “Book a room” tab at the top of the page or if you prefer call or email. Please call or email for long term rates or without breakfast rates. Please Note: There is a 2% charge for ALL card payments this includes business credit/debit cards also.